Platelet Rich Plasma therapy (PRP) is the non-invasive treatment to treat long lasting musculoskeletal conditions by natural healing. As per American society of plastic surgeons, around 18.1 million cosmetic procedures are done in the U.S. in 2017. Stop Sports Injuries report stated that there are around 2.45 million sports injuries takes place in high school athletes and more than 3.78 million kids under 14 years receive treatment for sports injury in the U.S. in 2017. In general, PRP is not considered a first line treatment and is usually considered after other more traditional treatments have failed. United States platelet rich plasma market is poised to reach USD 265 million by 2025 with a CAGR of 5.5%. Increasing scenarios of chronic tendon injuries, acute ligament and muscle injuries, surgery, knee arthritis and fractures are boosting prospects for the market. Rotator cuff injuries, lumbar spine disc pain, shoulder pain and instability, tennis and golfer’s elbow in the athletes are effectively treated. However, exponentially high costs for cosmetic treatments and lack of proper reimbursement policies could hamper the platelet rich plasma market’s trajectory. Leukocyte-rich PRP is the fastest growing segment, on the account of presence of inductive properties that encourage healing, reduce inflammation and the most favorable methods for the treatment of soft tissue defects. Orthopedics accounted for 35.1% of total market share in 2017 as PRP injections aid in rapid augmentation of soft tissue healing process while cosmetic surgery and dermatology application are the fastest growing segments. The report covers the present ground scenario and the future growth prospects of the facility management market for 2017-2025 along with the market players’ analysis. We calculated the market size and revenue share on the basis of revenue generated from major players worldwide. Platelet Rich Plasma market is forecasted on the basis of revenue analysis, product benchmarking and strategic developments of key market players. United States Platelet Rich Plasma Market Outlook 2017-2025, has been prepared based on an in-depth market analysis from industry experts. The report covers the competitive landscape and current position of major players in the Platelet Rich Plasma market space. The report also includes porter’s five force model, SWOT analysis, company profiling, business strategies of market players and their business models. “United States Platelet Rich Plasma Market Report” also recognizes value chain analysis to understand the cost differentiation, pricing models to provide competitive advantage to the existing and new entry players. 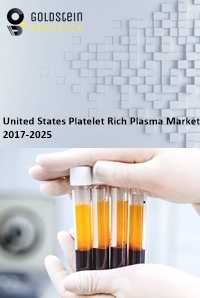 Our United States Platelet Rich Plasma Market Report comprises of the following companies as the key players: T-Biotechnology (T-LAB); Arthrex, Inc.; Terumo BCT, Inc.; EmCyte Corporation; DePuy Synthes; Zimmer Biomet; Stryker; Glofinn Oy; DR. PRP AMERICA, LLC, Harvest Technologies Corporation, Arteriocyte Medical systems, Regen Lab Sa, Exactech Inc., and Cesca Therapeutics Inc.